Jenny in office is a pip ( Pretty Intelligent Personable ), she knows her stuff! Being able to rely on her makes the whole place orderly and managed. I know several folks that have units. Jenny and Keith have always treated me fairly and with respect. They have always went out of their way to be friendly to me. I appreciate that kind of service especially in this day and age we live in of non customer service from businesses anymore. I have no bad nor fair words to say about the storage facility or staff...only good remarks. Jenny and team are knowledgeable, friendly and seem to treat all customers the same...as people,or I could go as far as to say friends. I never have a problem with access, payments, billing, or unanswered questions. The facility and grounds are always clean, secure and well managed. I never doubt my items are safe. Excellent customer service, clean units, great price! I will most definitely recommend this facility for its excellence in customer service, professionalism and courtesy, timely response time and eagle eyed security. Jenn was fantastic. I purchased an auctioned storage locker and she made it go very smooth and easy! I enjoyed working with you. Just tlean - plus great,helpfultworthy manager. Thanks Jenny and all. Management has always been pleasant, and very helpful. I have been renting two units for several years and I have been with other storage facilities and American is tops. Very clean and well managed. My family and I have had a storage at this location for over five years. I cant thank them enough for having us. Great service, and outstanding representatives. Jenny is always ready and willing to help. She is an excellent leader and all around stellar employee, and well deserving of a raise. I can not express to you the level of gratitude that I feel to jenny and this company. Forever my friend and always American self storage. I will never go any where else. Much love and respect. We greatly appreciated the care and thoughtful attention. To Whom it May Concern: Jenny has taken care of our every need and concern with a sense of thoughtfulness and attention to detail. During the times that we have done business with your company we were going through some personal difficulties. Jenny went above and beyond to make our world a little bit easier. Your is company is blessed with a wonderful human being, and an outstanding employee. We really cannot express enough how much we appreciate her thoughtfulness. Jenny is super! Keith is great too although I haven’t had the need to deal with him. Place is very clean. I would agree that we could use a restroom to use when the office isn’t available. We had a large unit to start with, but we downsized and Jenny was very helpful in finding one not too far from ours to move to. This is the best storage facility and staff that I've rented from the manager and her husband both address any issue that arises as soon as it happenes and I have rented storages in several states not only for personal and for business. The management is great and property is clean, will only store here. This place is absolutely the best place to rent a storage unit or space. Jen is a very kind and caring manager, the facility is very clean, and well maintained. We recommend this place to many people as it is simply the best in town no question. Very friendly and helpful staff. Unit was clean and facility also. Management is outstanding! These guys are great! Wouldnt go anywhere else for my storage! If you ever need a storage or uhaul truck go in there and see Jenny right away! She will do anything she can to help you and she's also fun to talk to! Great prices, clean trucks, nice storages, feels very safe and secure, and JENNY is there....what more can one ask for? Love these guys! Super amazing storage! 630am on a Friday morning. Just visited my storage and it is so clean and inviting this time of day! The management does such a great job keeping up with everything. Did I mention quiet and peaceful? Keith is running around on the golf cart so us single ladies feel secure and well protected which is a huge reason I have stayed so many years. Thanks Jenny and Keith, You are WONDERFUL managers! But please no port a johns....thanks you guys are the best! The only tiny problem I ever had in the last 8 Years was not being able to get them on the phone. When I went in there fuming mad... Jenny calmed me down and asked why I left no message? I didn't have a reason but I didn't. So they didn't even know I had called and that makes sense. Next time I called I left a message. Jenny called me back within minutes! One other time it took Amandy about an hour to get back to me. Still better than spending the day dialing and hanging up and dialing and hanging up etc for 6 or more hours....Duh lol. I used to do this monthly! Not so smart of me.... Other than that little hiccup, its always fast and easy and prices are great. I get a small rent increase here and there sometimes but I'm fine with that considering the great service and clean facility. They take care of their customers here! She is so great you have to get in there and see her! Such a sweet girl we love you Jenny!! I AM AMAZED AT THE LEVEL OF CUSTOMER SERVICE WE HAVE GOTTEN HERE!!! NOT ONCE, NOT TWICE, BUT 3 TIMES NOW! AND BEING HELPED BY 2 DIFFERENT PEOPLE, BOTH OF WHOM WERE JUST WONDERFUL. JENNY SHOULD BE A TRAINER FOR ALL OTHER STORAGES AND KEITH HAS A "CAN AND WILL" ATTITUDE WITH A GREAT SMILE FROM BOTH. WE WILL BE BACK SEVERAL TIMES OVER THANKS ANERICAN FOR THE GREAT EXPERIENCE!! So to anybody moving or need to store anything American self storage-east mesa is a nice place ,very clean inside and out, nice storage rooms, Managment is on property 24/7 , you'll meet a pretty young lady named Jenny that will happily handle your every need, 5 stars.....you'll like it there too. This facility and the people are awesome!! Clean and friendly. Good hours. Security..everything all the way around is awesome!! Glad we choose this place for our storage. I have rented 8 uhaul trucks with american over the last year. Each one of them were particularly clean compared to other uhaul locations I had used before them. I rented a storage here also when Keith talked me into it. I was storing my things with friends and family because I was in between selling and buying homes. He explained the price was for a full month and it wouldn't change for up to a year. 8 months later I am still here and it's been so much easier than dealing with friends! I also know to expect an increase around 1 year after I started renting here. I forgot to lock my unit all the way 4 times and each time Jenny or mandi called me within hours and had caught it already. They are very good here and super easy to recommend! Thanks guys! Wish there was a bathroom for the tenants! If no one is in the office your stuck having to leave all your stuff open and run to the gas station or risk wetting yourself. Other than that, the staff is Great! Have even opened the office after hours for me twice with a smile! I’ve had no issues with bugs, mold, etc. clean facility and friendly service. Best storage company in the area, by far! I’ve been renting a unit here for almost 10 years. The management staff have always been extremely helpful and courteous. I’ve been out of the country and had to communicate by phone and email and have always received quick responses and issues resolved without exception. The prices for a storage unit are also very competitive and have rarely increased over the years. 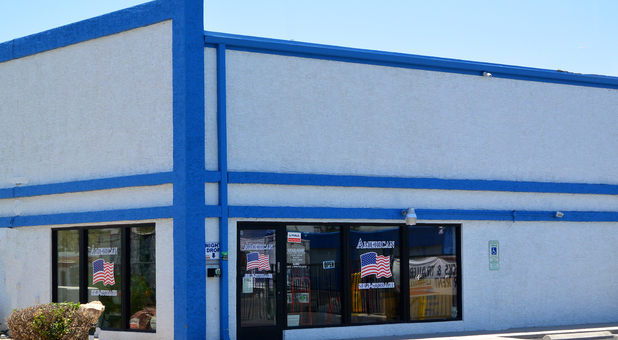 I have used many different storage companies over the years, but American Self Storage East in Mesa, AZ. is without doubt, the best! I have had a unit here for 3 years. The owners and staff are always very friendly and helpful. The entire storage is clean and climate controlled which is the main reason I picked American Self Storage East in Mesa, AZ. I have never had a problem here and I always recommend it to any of my friends considering a storage unit. Most awesome storage facility in Mesa,Az. To any one who has not rented from American Self Storage at 8050 E. Main St in Mesa,you are really missing out!!! This is by far the friendliest,cleanest and most reasonably priced storage around,and the safest!!! The staff,managed by Jenny and Keith Rayna along with Mandi makes this storage so unique! You don't just feel like a tenant,they make you feel like family. They pass out cold water on those hot Arizona days,you may come into office and cool down.... The facility offers not only your regular outside units,but indoor units also,it's equipped with about a 1000 cameras recording at all times along with a locked gate you must have a password for. I've never seen a cleaner facility or staff that goes out of their way to help you. It doesn't matter what it is,if they can help you,they do it! They are always dressed professional and are still the kindest people you ever want to meet. They also rent out u-hauls and if they don't have the one you want on lot,they go out of their way to get it for you.I've never seen a piece of trash laying around or anything out of place. To the owners...I think your extremely luck to have them and I think they should get the visa card for being so awesome! I'd really love one too. Lol. But.. I give it 5 stars and would give 100stars if that was an option. Keep up the great work,and anyone looking for a storage unit,go check it out. You won't want to leave. Good luck to all and Happy New Year!!! Always feel safe and staff is so friendly. Our parents referred us to American Self storage 10 years ago as they also had units there over the yrs. We really appreciate the friendliness of the staff, and we feel completely safe whenever we go to our unit. The only reason we would ever leave is if we ever get rid of all our “stuff”!!! Best storage facility in AZ!!! I have been renting a storage unit here for over 10 years...and sometimes more than one unit. I wouldn't dream of going anywhere else for any of my storage or moving needs. They are professional, courteous, always friendly and willing to help in any way. I highly recommend American Self Storage East...!!! A clean, safe storage facility with excellent customer service. American Self Storage is a much better alternative to the often predatory mega storage chains. I've used storage facilities for many years for business purposes; American Self Storage, and the Manager Jenny, is the best I have experienced by far. This is a great place to store if you need extra space. The units are all different sizes, with different door combinations. For instance, I have a 10x5 unit, but two doors because it is 10 long and 5 feet deep. This is good because I get more light into my unit. Jenny really works hard to find just the right space that will work for your needs. Jenny is the most hospitable! She offer a bottle of water, we chat, she takes an occasional payment from me. Jenny made the transition from a large unit to smaller unit seamless! Thank you Jenny! You're the best! Clean storage, great managers, and great prices. We are really hapoy we found anerican storage! Rented a truck and was very happy with the customer service I received. Mandy was very helpful and I felt she told me everything I needed to know and be aware of. Would come back for sure. Happy to have met you all Thanks! Thank you for the years of the best customer service! This place is always so clean and perfectly up kept. Managers are always super helpful except it's hard to get them on the phone. I've been there with a line out the door so I understand that! We used to be with a "big box" storage facility and they raised my rent every 3 months, at least 15 to 25% each time! Very happy to say that after 3 years i have only gotten 2 increases and both have been well under 10%! This 2nd time was only $2. I will gladly pay that since I know the Managers are great and they keep a very good eye on the place. Thank you for giving me peace of mind, to know my things are safe and Jenny is great. She may have eyes in the back of her head since she's always on top of everything. Such an easy recommendation! Just simply the best storage facility in the state! Keith and Jenny are the friendliest and most helpful managers ive met and they always go above and beyond! Would never even dream of comparing them to other storage places because it's just not possible. Corporate storage places have a distinct lack of everything that matters in this business. Keith and Jenny have it all and have it IN SPADES. Keep up the great work guys! Great staff and facility. Very happy and will never go anywhere else. Thanks Keith and Jenny! Service at this facility is way above expectations. Very impressed and surprised to find this level of customer care at a Uhaul and storage facility. Don't change a thing Jenny! I have recommended this facility to friends. Place is clean, well secured and climate controlled. I love the owners and staff who are always very friendly and professional. Have been renting here for 3 years. Never had a problem. We have been renting at this facility for over 10 years. We have three units for our personal things and three units for my decorating business. The current Managers are very friendly, kind and very helpful. Always there for us if we need them. We are there so often we feel like they are our extended family. Thank you for your excellent choice in management! Thank you American Self Storage!!! I have been a customer at American Self Storage for 10 yrs now. I have never had a problem with the staff or the facility. I have found that if you have a problem they will work with you to solve it. I would deffenatly recommend them to others. In fact two of my family members have rented units there. Clean, friendly managers, easy on-line access! Yes, people are friend and it’s clean. I would definitely recommend Jen & team. This facility is professionally run with excellent customer service Always prvided by Jen and her team. Any requests are completed quickly and efficiently. Really enjoy storing my home contents in this facility with these fine folks that manage it. I've been impressed with the cleanliness of the facility. Office staff have been polite and helpful. THE CUSTOMER SERVICE AT AMERICAN STORAGE IS TOP NOTCH! JENNY IS ALWAYS ACCOMMODATING AND HELPFUL. Best place ever. Clean safe welcoming. Great prices. ABSOLUTELY!!!!!!! I HIGHLY RECOMMEND AMERICAN SELF STORAGE. Whenever the subject comes up, I honestly tell people, "if you don't want to be treated like a number, go see Jen, Mandy, and the rest of the wonderful staff and American Self Storage East Mesa"! This place is clean, efficient, wonderful to work with, knowledgeable, very knowledgeable and can assist you with your storage needs. The same staff is still there since I've rented in 2015. Folks, that says everything right there. I've also called the 800# and was pleased with the attention and problem solving effort I received on 3 different occasions. THIS IS YOUR STORAGE FACILITY. NO NEED TO LOOK ANY FURTHER, PERIOD!!!! I've rented from American previously and returned due to great service, pricing, and facilities. Jenn is polite quick to assist and even offer a bottle of water on a hot AZ day! This was the first time we have had to use a storage unit due to downsizing after 55 years of marriage. Staff is wonderful and facility it always clean. Thank you. Love the staff.. they always have great attitude s personably just nice to be around..place always looks clean.. They keep the place clean and are very curtious. Jenny was amazingly awesome! She made returning the u-haul a breeze! She is a lovely addition to your team! No complaints ever. If payment doesn't go throu on auto pay. They are diligent about getting a hold of me.. customer service is great! Jenny helped me with a last minute Uhaul reservation today-She is awesome! After calling several places and getting no answer and no help from anyone in hours she knew exactly how to help me. Will be back for a truck and for storage because of her! Customer service great. Have been with American storage for almost a year. Easy to use website and the description was as promised. Very Good Experience. Been There For Over 5 Years. All the managers have been very helpful and friendly. This is why I've had a unit so long. always recommend to my friends. Great place. Always Have Had A Good Relationship. I had an issue with my boat trailer tire. Jennifer gave me a call right away to inform me. I was out of town and I really appreciated the call. I feel very confident that my boat is in good hands. I'm a long time customer and i will always use Amercan for my storage needs. Thank you. Decent office hours, price on par with others in the area. Only gripe is no restroom anymore inside the facility, only in office. Lady who runs it is nice. It's a clean facility. I'll keep renting and referring people. I amVERY VERY impressed with this facility. They have an "I care" approach. They have so many different people to deal with. They have probably heard EVERY situation imaginable. It's doesn't just seen like a JOB to this particular team of East Mesa. The actually listen, help YOU to the best of their ability. Not to just sell, or up sell, or just fill their units. They were a bright little spot in an otherwise very dark time. THANK YOU EVERYONE AT EAST MESA AMERICAN STORAGE. In One Word... " Stupendous !!! " The manager was awesome !! I had easy access to the unit I was renting... I had no bug or rodent problems... and I even got a discount on the unit because I rented a truck from them to move my stuff !! been with them for 2.5 years, wouldn't go anywhere else. Jenny is awesome. Wont go anywhere else! I have 3 units and they are always so great! Always happy to help. I have not been able to gain online access in months though. Jenny is helping me figure it out. The managers here are just amazing! They made the process so easy and helped me so much. I will be recommending everyone I know to come here. Thank you! Jenny has been amazing!! From start to finish, from the time we needed a storage unit to the end today. She has been so great-helpful, informative, friendly, and extremely nice!! SHE is the reason we chose this location!! 661-992-0520 If you have any questions! She's super good! Great prices and great location!! Best place to rent-The folks here are awesome!! Jenny and Keith are the sweetest people, so helpful, and kind. They do an awesome job. Great facility to rent my first storage unit! Jenny was very helpful and sweet! She opened the office so I could use the restroom after hours. I really wish there was a bathroom in the building or somewhere on the property. I left here feeling great and that was all because of the manager,Jenny. She was great and helped me through the renting process with storage and then Uhaul all at the same time. I had no idea what to expect as this was my first time ever renting anything. I have never left any store and hugged the manager before lol. Until the day I met Jenny! Thank you again! This was my first time renting a storage space and the managers made it so easy and simple and I left feeling that I really knew what to expect and was very comfortable with my lease and the facility. The managers are very nice people who are very willing to help with anything you need. I was extremely happy to have chose this facility after a bad experience with another facility the same day. If you have questions or don't know much about renting storage I would definitely recommend you stop in and talk to Jenny. She is great and is always ready to help. Thank you! Staff was very clean and also very friendly! I just rented my 3rd storage space with this place and they are just awesome. Best rates in town, best managers, and easy access. Though I do wish they had longer access hours. I still would not go anywhere else! Keith and Jenny have been such a great help to me this week! Without them I might have not made it through this move!!!! They really know how much customer service means to people and will gladly help you with anything they can!! I am a 78 year old lady and was trying to move my storage by myself, after my sons decided not to show up, Keith and Jenny checked on me, brought me cold water, and made me come sit inside and cool down when my face was getting red. All that ON THEIR LUNCH BREAK too! Then they went so far as to help this old lady move all of my things into my uhaul because I clearly could not do it myself. They are just wonderful and amazingly kind people and I thank the Lord they were there when I needed them. I would always recommend this facility to friends and family and will be back for sure because of these 2 great people. Extremely professional and Friendly management. Excellent Service! Staff helped us with everything we needed and went above and beyond. Great facility! And second year returning client. Bob and Lisa are outstanding managers possessing all the attributes that customers appreciate. Excellent security and fair monthly rates which is essential in this business. I also appreciate the newly paved lot which creates another positive impression of the organization willingness to invest in extraordinary maintance. Rented from them for over months and was 100% satisfied ! If we ever need to rent a storage unit again, You would be the first one we would consider. I want to thank Lisa for all her help, I appreciated her kindness and letting us know what to expect. Great customer service. Clean. Easy to find. Excellent security. Very Nice Facility and Everyone was really nice to us. Lisa and Bob are very friendly and helpful and knowlegable about conditions and what would work for me. Staff is very pleasant to deal with, Very Clean, Everyone is very helpful, Easy to access. This place is a great place when I go through the gate I always get a friendly wave and a smile, I would never store my work items anywhere else. I truly can say I've been treated like family from Bob and Lisa, Me and my dog Buddy are very greatfull and happy with there efforts helping us. We were moving away and at the last minute we had an issue with our truck and it had to be left behind so we rented a unit here the staff was so helpful and so friendly, Thank You! Bob and Lisa are super easy to work with and They are a very pleasant couple. Renting with this company I had a very happy expieriance. The customer service was outstanding. The lady that helped me was very friendly and so willing to answer all of our questions. Nice clean facility, professional managers.